this should have been here long ago, as this project began in October of 2009. After many delays, I would like to invite you to post your comments and SWAG updates here, as will I.
I went into debt getting these items made because I felt compelled to bring them into the world. At one time, I hoped to recoup my losses by selling the SWAG to break even. Now…. the time for some of the SWAG seems to have passed, and for other items in the SWAG collection, the meanings have simply changed. Despite the passage of the health care bill in March, many of us are still underinsured and uninsured, and may remain so for at least the next 3 years. Many of us might still be denied coverage for health issues in these intervening years even if we technically are “covered” by health insurance. So the meanings of the temporary tattoos, after the (relieving, momentous, minor but necessary) passage of the bill, are a little more like whispers – the parentheses around the words now seem to mean, “Psst! Hey – guess what? 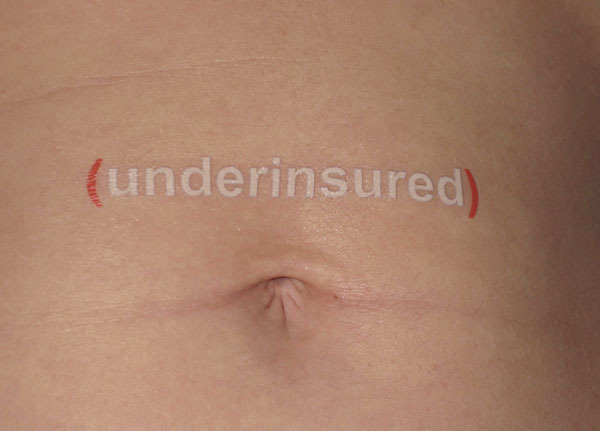 The secret here is that I’m STILL uninsured!” As someone who may soon be denied coverage for a condition I’m currently undergoing treatment for, I will once again be wearing the tattoos, myself….. This entry was posted in Uncategorized and tagged beginnings, compulsion, debt, denied coverage, Sarah Petersen, SWAG for Hard Times, underinsured, uninsured. Bookmark the permalink. Post a comment or leave a trackback: Trackback URL.